If you are heading west along the M18, as you approach junction 1 you will see on your left the Stockyard Truckstop, on an industrial estate on the outskirts of Rotherham. To get to it from the motorway, leave at Junction 1, take the A631 towards Maltby and then take the first left onto the industrial estate and follow the road round until the truckstop is on your left. It is signposted. 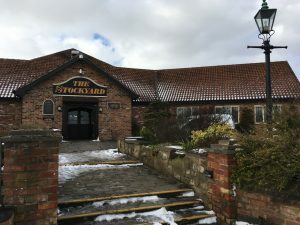 The Stockyard describes itself as “a truckstop with a twist” and urges people to not think of it as a “greasy spoon and formica tables; think fresh, home cooked food and a warm friendly atmosphere, where everyone is welcome!” That is most certainly true, it does not feel like a truckstop, more like a pub you’d take the family to on a Sunday! 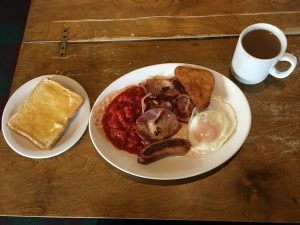 The standard breakfast is £4.35 and comes with bacon, sausage, egg, hash browns, beans or tomatoes and a slice of toast or fried bread. The Stockyard breakfast is the same but has an extra egg, mushrooms, black pudding and both beans and tomatoes. It costs £5.40. A bacon or sausage sandwich or roll is £2.75 while beans on toast is £2.30 Eggs on toast – poached, fried or scrambled – is £2.75 and a fried egg sandwich is £2.20. Two slices of toast, with jam or marmalade, is £1.20 and toast and butter is £1.10. A bowl of cereal costs £1.20. A mug of tea is 70p and coffee ten pence more. Breakfasts are served from 0500 so if you are due an early start, you can still get a good start to the day by a decent meal inside you before you get on the road. Evening meals are available from 1700-2100, Mondays to Fridays. 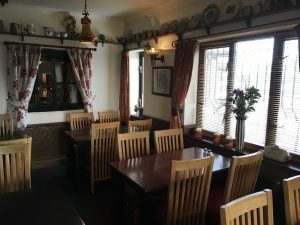 On offer are prime rib, silverside of beef, gammon roast, loin of pork, homemade steak and potato pie, lamb shanks, cottage pie, lasagne, chicken stir fry and all are served with seasonal vegetables. There is also a daily special on offer. There is also a salad bar, with cold meats, quiche and other salads. If that does not appeal then there is a fish bar with haddock served with chips, mushy peas and bread and butter. The chips are rumbled, chipped and fried freshly and the Yorkshire puddings are also cooked fresh and not pre-packed mass produced, bland ‘rubbish’. For ‘afters’ there is a wide range of puddings and sweets – both hot and cold – which are served with custard, cream or ice cream – you need to ask the staff for what is available. The food is cooked fresh on the premises daily and breakfasts are cooked to order with only a short waiting time. Lunches can be served in the bar or restaurant, and are also cooked to order. Harry’s Bar is the pub within The Stockyard and has numerous entertainment nights with music, singing and dancing. Music nights are on Tuesdays and Wednesdays, with Darren Knights providing karaoke from 2100 on both nights, while on Thursdays and Saturdays, resident organist Ian Dodds accompanies some of the very best singers around. There is a wide range of beers and lagers at competitive prices. There is also a large range of bottled beers and wines. The Stockyard has outside seating areas and a smoking chalet to the rear of the bar which is well lit and heated, providing smokers with as best a degree of comfort as the law permits. The Stockyard is open 365 days a year, and – unusually for a truckstop, that even includes Christmas day! It has ample parking for trucks – over 200 artics can be accommodated! Overnight parking charges are £13.50 per truck and the parking area has CCTV and a security guard to keep vehicles safe from intruders. Inside there is free wi-fi as well as TV, including Sky Sports. 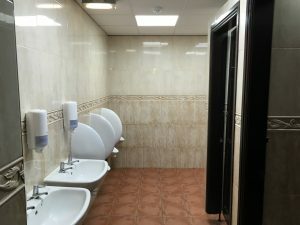 There are showers which are free to use for all drivers. 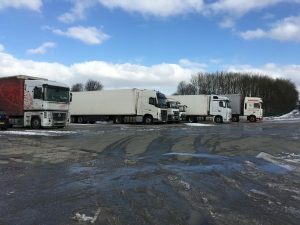 The lorry park which can accommodate over 200 trucks and is presently 80% tarmacked with plans to completely tarmac the whole surface in the near future. The Stockyard has a nice ambience to it. 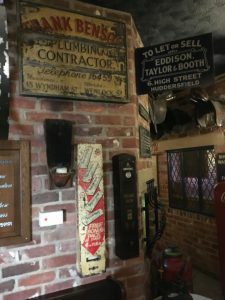 The bare brick walls, covered with motoring memorabilia and old school cigarette machines, signs and vending machines give the place a pub-like feel. The dining area is well thought out, with alcoves for groups. On TSN’s visit, we found the food very good, the breakfast was good value, good quality and the tea was spot on. The staff were also very friendly and welcoming. If we had one gripe, it was this. The day we visited, the weather was poor, with snow and ice aplenty, and the walkways were not gritted which made it a bit too slippery under foot. Of course, that is the exception rather than the norm, and I guess if that is the only thing we were moaning about, it says a lot about the venue on the whole. This is a great truckstop in a good location.